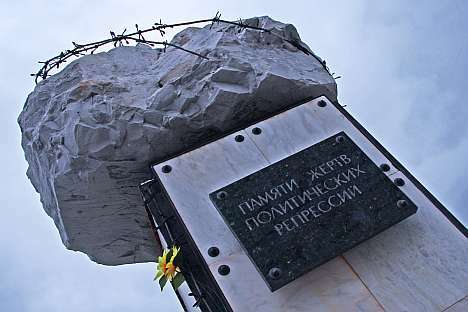 Every year on Oct. 31, Vorkuta residents meet at the monument to the victims of political repressions – an incomplete sketched mass full of rusty barbed-wire. Source: Alberto Caspani. The capital of the Gulag realizes that tourists may come because of its association with the darkest days of the Soviet state, but hope they discover that the city has more to offer. Vorkuta: the end of the line. The voice announcing a train’s arrival at the remote edge of the Komi Republic – a 48-hour journey from Moscow – can still make passengers shiver. The name conjures images of exile, and backbreaking work in arctic temperatures – the kind of life portrayed in Alexander Solzhenitsyn’s novel One Day in the Life of Ivan Denisovich. Yet the residents of Vorkuta today look like people anywhere else, greeting visitors as if traveling to the city were not a trip into the heart of the Soviet prison system. Vorkuta may be imprisoned in ice for nearly eight months of the year, but its citizens today are freed from the ghosts of the past. The Vorkuta settlement took its form in the period between the 1930s and 1950s. The town grew as prisoners were sent to work in its enormous mineral deposits; but only about 50 residents can say today that they had family members who were involved in the mass deportations. The few remaining survivors have all gone: some searching for relatives all over Russia, others in order to forget, still others just to carve out a different future for themselves. Every year on Oct. 31, residents meet at the monument to the victims – an incomplete sketched mass full of rusty barbed-wire. Thanks to the commitment of the group of volunteers led by the Mamulaishvili family, the memory of those who lived through the hardships of life in the Gulag is preserved. The monument is built on the spot where investigative geologist Georgy Chernov pitched his tent in 1931, effectively founding the city. Part of the credit is undoubtedly due to the Komi folklore festival, which is held every year from Nov. 1-7 and attracts representatives from the numerous ethnic minorities that are scattered all over the territory of the Komi Republic. The local administration has given more support to the event over the years and it now includes sled races, folk dances, local street markets and contributions from as far away as Norway, Switzerland, and Germany. The places of memory known to all Vorkuta school children attract more and more visitors each year thanks to the efforts of the local administration, which encourages residents to pass on their knowledge of buildings and locations to others. For example, what at first sight appears to be a collapsing classicist building turns out to be the first public showers in the Komi Republic. A shaded paved alley on the outskirts of the city is actually the remains of the Vorkuta main road from the 1940s – the proud Victory Boulevard. Kirov Square, surrounded by elegant Stalinist buildings and the region's first grand hotel awaits the arrival of a monument to architect and political prisoner Lunyov. Vorkuta is gradually extending its borders; expanding into the uncultivated fields at the edge of the city towards the ruins of Yurshor in one direction, and Severny Poselok's brick smokestacks in another, along the winding routes that men, exhausted from working in the mines once took, carrying piles of coal in the midst of exhaust fumes. Today they are traveled by blue trucks, running between today’s work camps and the winding streets of the city. Although much in the city has changed since the Gulag years, one thing that remains the same is the fields of Ivan Chai, a wild herb that grows in the countryside around Vorkuta. Every spring it blooms in blood-red flowers, reminding some of the tragedy that befell this far corner of Russia.